A comma is a versatile punctuation mark, serving ten basic functions. Here’s an enumeration, with examples. Exceptions include sentences with closely linked clauses (“Go to the window and see who’s there”) and those with a compound predicate (“The Marx Brothers are known for their puns and their sight gags”). 3. Separate an introductory word (“Naturally, I agree with you”), phrase (“Last summer, I went on a long vacation”), or subordinate clause (“If you’re too busy now, wait until later”) from the remainder of the sentence. 8. Separate a salutation from a letter (“Dear friends,”) or a complimentary close from a signature in a letter (“Sincerely,”). A colon should be used in place of a comma in a formal salutation. 9. Separate elements when setting off a term for a larger geopolitical entity from that for a smaller one located within it (“Santa Barbara, California, is located on the coast”) and for elements of street addresses (“1600 Pennsylvania Avenue, Washington, DC”) (and dates (“January 1, 2013”). 1. Is the second part in this sentence, which you used as an example in your blog, a separate coordinated independent clause if it cannot stand on its own. I mean can ‘and their sight gags’ stand on its own withoug a verb. You gave this as an example where the coordinated independent clause is closely related and thus does not need a separating comma, correct? Pardon me for any language mistakes as I am not a native English speaker. Actually, omitting the comma before the conjunction in a series is considered correct when using the Associated Press Stylebook for a guide. If omitting the comma creates confusion, the AP Stylebook then recommends using it. The Chicago Manual of Style requires the comma before the conjunction. 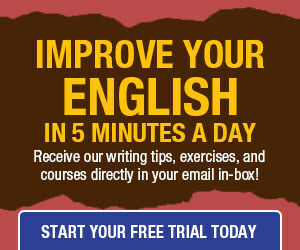 Therefore, the first of your comma uses depends on the type of writing you are doing. My writing question involves salutations, viz. how do you write, say, a semi-formal salutation to a person whose name you don’t know and, if part of an organization, whose postion or title you don’t know? I encounter this quandry particularly in addressing email responses to freelance job offers on the Internet. For example, a person whose gender I don’t even know, advertises for a freelance writer and does not leave his/her name. What salutation should I use in responding to such a request? Thank you so much. 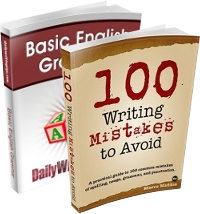 I do enjoy your daily writing tips and have found many of them quite useful. That is, in essence, what I wrote. The presence or absence of the serial comma depends on style, whether your own or from a style guide. The style for formal writing, as expressed in The Chicago Manual of Style and similar resources, is to use a serial comma. The style for journalistic writing, as expressed in The Associated Press Stylebook, is to omit it. However, I recommend it in all usage. My understanding is that outside the US the serial comma (or Oxford comma) is only recommended to avoid ambiguity. I’ve worked in New Zealand, Australia, Canada and the UK and the standard in those countries was not to use it. I have noticed in the US that everyone seems to include it. Might be worth clarifying for the international readers. That “final comma” is required by the OXFORD University writing guide in the U.K., hence that comma is widely used there. On the other hand, many Britons thumb their noses at Oxford University, the United States, Canada, etc. I am very much against that. Things should be written the Oxford way, the American way, and the Canadian way. I agree with Mr. Nichol whole-heartedly here. Please advise, I need to know as to which of the functions of a comma does the punctuation in the sentence below fit in. The editor of a document I wrote some time ago suggested that I punctuate this sentence as indicated below, but, as a second language writer, I always find it difficult to decide on whether to punctuate like this or not. Which rule do I apply? Please help. I recommend omitting the serial comma if you’re following AP Style. It’s not a matter of choice: It’s a rule.